Left and Write: A is for: Automan! Welcome to my second foray into one of the most grueling (relatively speaking, of course) of all blog hops. The A to Z Blogging Challenge! As I mentioned in my last post (before I accidentally deleted it, that is), my theme this year is going to be "Old Television Shows". The focus on ones I used to love when I was younger. Along with some facts from each show, I'll try to give some insight, thoughts, and musings on just why these shows stick out in my mind....even after all these years. So, let's get to it shall we? 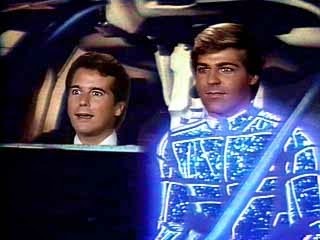 Heavily, and I mean extremely heavily, influenced by the film Tron (at least special effects-wise), Automan told the tale of police computer expert Walter (Desi Arnaz Jr.) Nebicher who wanted nothing more than to get out of his cold, cramped, computer room. Coming up with a way to bring almost living holograms to the 'real world', Walter creates Automan (Chuck Wagner)....or Otto Mann, as he was sometimes introduced. Automan and his pal Cursor (a little ball of light that helped Auto create such things as cars, helicopters, and motorcycles) helped Walter solve cases that your standard, non holographic, officer just couldn't solve. As with most of the shows I'll be highlighting during this month, Automan was pretty cheesy by today's standards. The dialogue and formulaic approach were standard 80s fare, but I've always loved it. Even though it was done during a more "tame" time in television, I remember Automan still being a bit "risque'" in some of it's humor....especially when Cursor, who seemed to have a pretty good libido for a ball of computer light, showed up. I also remember Automan being pretty arrogant, telling Walter that on a scale of one to ten, he should consider him an eleven. 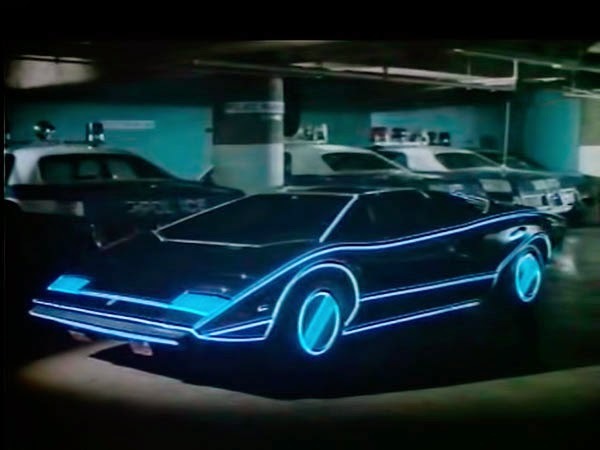 My favorite bit on the show was when Automan would drive Walter around in his holo-car (a Lamborghini, if I remember correctly) and turn a corner. 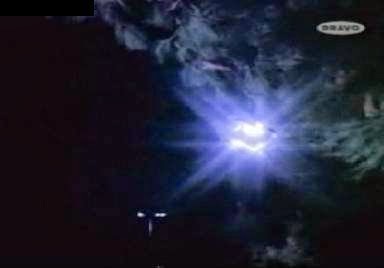 Since it was made of, basically, hard light particles and, I guess, didn't have to follow every law of physics, it could take corners on a dime. Every time he did this, it would always throw Walter up against the window. I guess the Auto-mobile didn't have seatbelts. Tune in tomorrow for "B"....a story of a lovely lady, who... (it's not what you're thinking...I promise). Oh, man, I loved Automan! I was so disappointed when it got cancelled after just one season. I'm drawing a complete blank on whatever you're hinting at for tomorrow. B makes me feel like a certain theme song is coming on. Never saw Automan but I'm sure I'd get a good laugh now. Hi Mark .. I've never seen Automan .. and had thought you'd 'said Automaton' .. so I got brought back to earth quite quickly ..
Fun for kids and youngsters at the time .. and obviously well remembered despite its cheesiness .. I remember that show! Yes, very cheesy and very much influenced by Tron. I never saw this show, but your clue for B took me down Memory Lane...yes, I'll be sure to tune in, to see if I'm right. Wow. I don't remember this one at all. Frankly, I am shocked that we didn't watch this show. We had one TV and my dad chose the programming. He loved sci-fi stuff, so I would have thought this would be right up his alley. Wow. I haven't thought of Automan in years! I was a big fan of the show, actually. Should I admit that in public?! I LOVE this show although it doesn't hold up in rewatchings. I had a girlfriend that was obsessed with this show although it was more about Chuck Wagner than the car. A surprising post Mark! Keep it up! I don't remember Auto man, but sounds like it was a fun show. That's what I love about your blog, I always learn something new! Oh boy, loved that intro!!! I've heard of Desi Arnez Jr., but never of Automan. Where do you find these blasts from the past? I honestly never heard of that show but I think I would have liked it. I'm a 70's/80's child but I don't remember this at all! I honestly thought I knew all 80's tv. How fun. Can't wait to see what other shows you pick. I've never heard of that show but it's something I would have watched as a kid...maybe even now! Nope, don't remember this one, even though I was a child in the 80's. Wasn't born in that decade though. I have never seen Automan, will have to check it out on Youtube. As a child of the 90's, I guess it's not surprising that I've never heard of this. It sounds pretty good though. Yes, I agree! Cheesy as it was I loved this show and have just rewatched all 13 episodes. Also I just made this page in its honour if any of you would like to join.